Cask is just a form of dispense - I'm not sure how you turn that into a credible ideology. It's like saying "sandwiches rock" - the format is really all about the filling. Mark, I love your enthusiasm for great beer, and as always this is a great bit of writing, but the logic here is just a bit skew-wiff. That's the Brewery Tap, innit? What did you think of the Leeds Brewery beers? Is it the first time you've tried them? First... ignore that formatting line. Stupid blogger. Zak - I get what you are saying. The collaboration was based on the Cask Ale Report, it's just taken a few weeks to get it out and up, so the title is kind of a hang on from that and to avoid using real ale or something like that. British Beer would perhaps have been a better title. I hope it's still illustrative of the idea that handpulled British beer is important. Beerpole - get something written, we hoped others would take part too. And it is the Brewery Tap in Leeds - I was there on Sunday and thought all the beers were very nice and easy drinking. I could've sat there for a long time and enjoyed them. I think there's a bit of confusion between cask ale and beer here too. You seem to make an assumption here that what cask ale lovers like in their ale is what every beer lover likes. This is not so, I'm, sure Cookie will testify to that. You might call something lightly carbonated but someone else would say flat. You might argue a certain lager is bland but to many it's safe, reliable and refreshing. And mass produced beer, ah, that easy to say sentence. Production on large and small scales can both be good and bad. Can the most drunk cask ales in the UK be described as genuinely hand crafted when they are being distributed across the length and breadth of the country every week? Is Thornbridge beer hand crafted - is the brewery not also a shining example of automated brewing technology? Mass production in it's own right is wonderful and is required for sustainable development. I love the idea and the Romance of hand crafted beers, and they also bring with them the diversity required to help beer survive, but good quality beer made on a mass scale is not only unavoidable but a wonder when it works. One thing I think you rightly highlight is the importance of British beer/cask ale, and it will be an integral part of helping pubs survive, in whatever format that might be. Good quality product will underline their survival ultimately as well as the role they play in the areas they serve. PS. Nice pic from Sunday I presume! You're supposed to drink it, not shag it, Dredgie. To solve the blogger issue, use the HTML editor rather than the rich text. 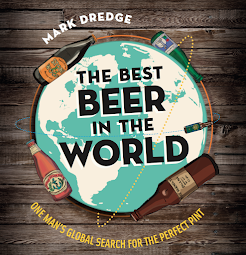 Mark - good beer is the most important thing, yes. We attempted this, as I said to Zak, to be able real ale more than anything else and with a 500ish word limit. It's not just about cask beer and I could've written 10,000 about beer in general in its different forms, but I made it personal, positive and about my cask experience. And there's nothing wrong with mass-production provided it's got flavour and more integrity than trying to earn as much money as possible. The semantics of that phrase should probably make it one of those things that beer bloggers should never use... I think I'll try and strip it from my blogging vocab! Al - that would assume that I had even the remotest understanding of html, which I don't. And when I try to edit in html after it's posted it still buggers up. I think they're describing something distinctive and worth celebrating in its own right, not just a style of beer which is sometimes done well and sometimes not. You could call it... oh, I don't know... 'real ale', maybe. ZakAvery is wrong. Cask beer is living beer, undergoing a secondary fermentation in the cask. Keg beer has been pasteurised or very, almost microscopically filtered to kill the yeast action and produce a longer shelf life. All beer styles, mild, porter, bitter, lager etc. can be contained in cask or keg. The dispense method is the next stage of moving the product to the drinking container. Beer deteriorates as it comes into contact with oxygen and wild yeasts. One would not dispense keg without adding pressurised gas or the advantage of a longer shelf life would be lost. Likewise, one would not dispense cask conditioned beer with gas top pressure because it would harm the beer, hence using hand pumps, electric pumps or similar for casks. The cask is designed for atmospheric pressure and is shaped to collect any sediment. Kegs are under a higher pressure but can be straight sided as there should be no sediment in a dead, sterile product.